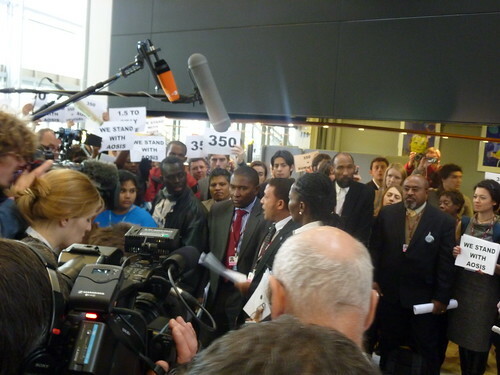 We were heading into a briefing for civil society by UNFCCC head Yvo de Boer, when I noticed a gaggle of cameras and a crowd of conference-goers gathering a short distance from the auditorium entrance. 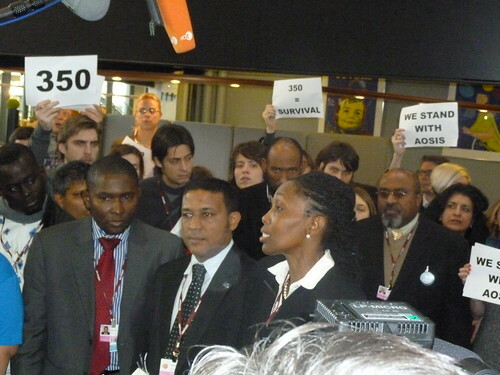 I slipped out of line, and as I edged closer, I realized AOSIS (Association of Small Island States, a bloc of 43 countries) was holding a press conference to lay out the group’s negotiating position. In the wake of the uproar over Tuvalu’s proposals the previous day, here was another bold statement by island nations. The first speaker, Dessima Williams (from Grenada and head of AOSIS, a bloc of 43 countries) was articulate and rather emotive. She emphasized that AOSIS members are on the “very frontlines of the devastating impacts of climate change.” Many are already suffering damage, and the effects will only grow worse with time. Watching her, it really hit me hard: these people are fighting for their homes, their livelihoods, their way of life. With global warming and rising sea levels, whole communities might simply disappear under the waves. I had understood this conceptually, but to hear someone facing this prospect make such a calm, yet impassioned statement -- when essentially everything is at stake -- somehow crystallized the situation. For them, it’s not merely an academic discussion of how many percent, from what base year, under what scenarios. It’s not a political question of “What’s acceptable to domestic audiences?” It’s a question of survival. - This means stabilizing at 350 ppm, rather than 450 ppm, and will require much deeper cuts from developed countries. - A legally-binding instrument. Though many have said only a political agreement is achievable next week, AOSIS wants the outcome to be legally binding. In laying out their position, AOSIS asked for developed nations to shoulder their historical responsibilities and for the whole world to take appropriate action to stave off disaster. 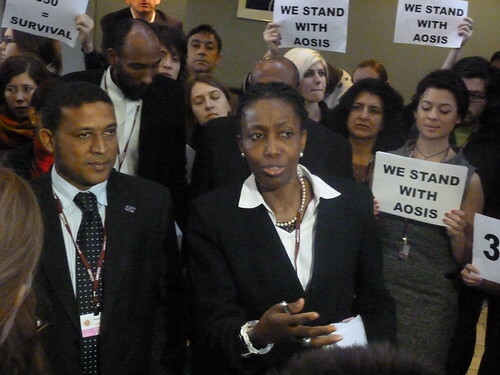 Williams noted that AOSIS countries would be doing their part: several nations will follow the example of the Maldives and pledge to go carbon neutral. Many more will implement renewable energy plans. They encouraged the throng of supporters (who carried "350 ppm" and "We support AOSIS" signs) to keep up the pressure. It sounds horrible, but a little part of me felt that they were being somewhat unrealistic, even extreme. (Though perhaps this view was also colored by the throng of demonstrators surrounding them). These demands seemed to be reaching outside what a final agreement could most likely achieve. Why derail the negotiations, where the world can at least start to act, by putting forward demands unlikely to be met? (In this article, Yvo de Boer mentions that developed countries seem to be set on 2 degrees, not 1.5) With 450 ppm, we can definitely push for serious emissions reductions and greater funding for adaptation. But what will happen if AOSIS adopts this hard line and then negotiations founder? Click read more to finish this post! The AOSIS representatives were adamant -- these proposals should be considered fundamental demands, they said. But it remains unclear whether this action was meant to stake out an aggressive negotiating position to create space for a more favorable agreement, or if these are truly make-it-or-break-it conditions. Perhaps they feel they have no other choice but to take a more extreme stand. I understand part of this is political posturing, to capture the spotlight and boost the visibility of island nations and their views. For small states that traditionally have a limited voice in international affairs, the COP may be one of the few instances in which their concerns can be heard and actually taken into account. (Since they are, admittedly, sitting on the front lines). However, in the weeks leading up to Copenhagen, the process seemed to be moving along with developed countries (EU, Japan, US), and large developing countries (like China, India, Brazil) seen as the key players. Perhaps then, these actions could also be interpreted as an attempt by small islands to overcome a feeling of helplessness, as other nations rolled through with their own agendas. Yet one somehow gets the sense that if island nations did not truly feel their way of life was threatened, there would be less inclination to take such a stand. There are easier ways to be heard. Whatever the case, it’s having an effect. By pushing the envelope, small island nations have changed the bounds of what everyone is discussing at the conference, and subsequent proposals reflect this. Kevin Hsu is pursuing a Master's degree in environmental engineering with Stanford's Atmosphere/Energy program. He can be reached at [email protected].